The lightweight portable scanner engineered for business. The Epson DS-70 is the lightest mobile single sheet fed document scanner. It can scan a single page in as fast as 5.5 seconds. 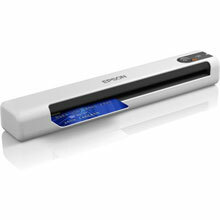 This portable scanner accommodates documents up to 8.5" x 72", plus business, ID cards and receipts. Can connect to a computer via USB port with no extra batteries needed.